Learning how to make fresh cranberry sauce takes no time at all. And ... absolutely no cooking talent is needed! Can you boil water? Excellent! 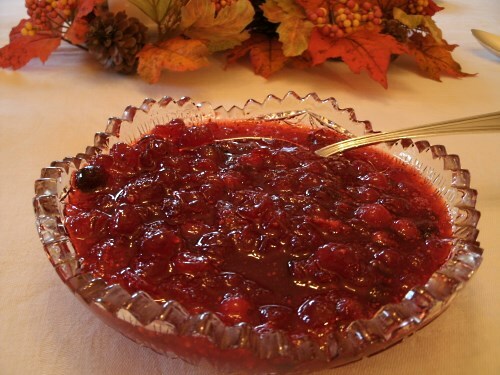 You have all the cooking skills required to whip up a batch of fresh cranberry sauce for your Thanksgiving table or for any day of the week. Note: One quart of fresh cranberries (approx. 20 oz.) makes about 6 half-cup servings of cranberry sauce. Making Cranberry Sauce "From Scratch"
Put clean, whole cranberries into a large saucepan on the stove. 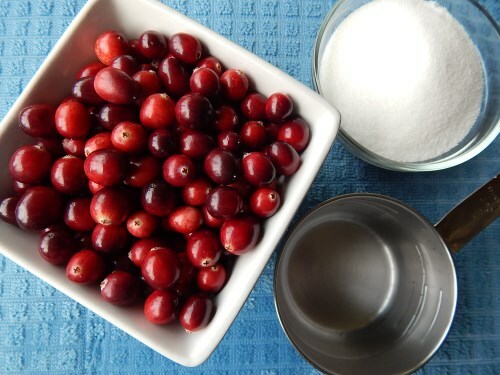 For each quart of cranberries you're using, pour a heaping cup of sugar into the pan, along with a scant cup of water. FYI: There's no need to be exact with your measurements. Just shoot for roughly a 2:1 ratio of sugar to water. Close is good enough! Now, turn the stove burner on, set it to medium-high heat, and bring the mixture to a boil. 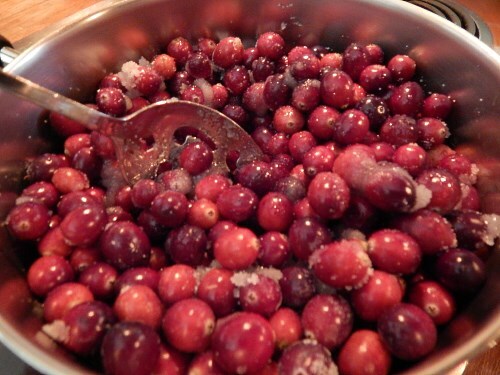 As your cranberries begin to boil, you'll start to hear a popping noise - like the berries are exploding. Yep, that's exactly what they're doing. Inside perfectly formed, ripe cranberries there's a tiny air pocket. As the berries heat up in your saucepan, their air pockets expand, and the berries explode. Thanks to those little air pockets, ripe cranberries also bounce like little superballs ... all over your kitchen, if you happen to drop them. Major oops! While your berries are cooking, give them a stir every now and then. In just a few minutes, the mixture will begin to thicken. Yippee ... it's saucin' !! This is a good time to taste your cranberry sauce. If it's not sweet enough for your liking, add a little more sugar and stir some more. Now turn the heat down, and let your sauce simmer for a few more minutes. 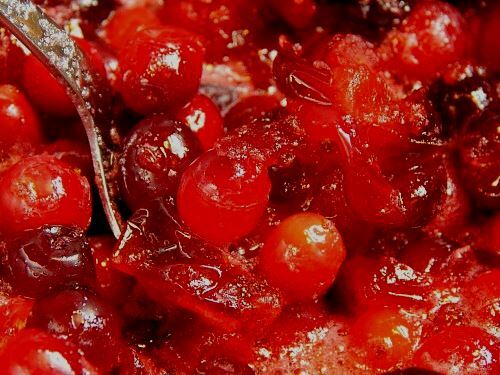 Be careful not to overcook your cranberry sauce. 10-15 minutes on the heat should be plenty to thicken it up. Any longer then that, you'll risk turning your sauce into a mealy-textured mush. Hint: After 15 minutes of the cooking time, your sauce should be the consistency of "sloppy" jam. Don't worry - it'll thicken a little more as it cools. Let your sauce cool to room temperature. Then serve it, or store it in the fridge, or freeze it for later use. 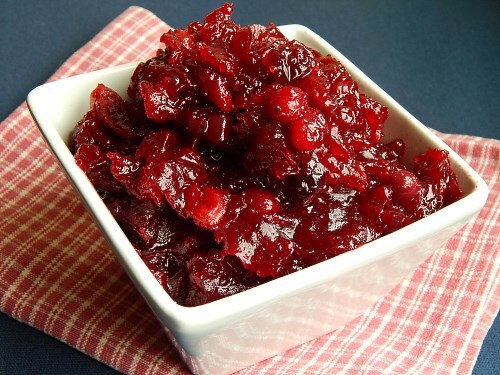 Enjoy your homemade cranberry sauce!! Are you one of those folks who doesn't care for "whole-berry" sauce? Heat the mixture to boiling. Stir. Then reduce heat and simmer for 10 minutes. Taste, and stir in more sugar if you'd like a little more sweetness. Set a small-holed strainer over a large mixing bowl. Pour the cooked berries and juice into the strainer. With the back of a large spoon, press and smoosh the contents of the strainer until every last drop of delicious liquid has been released into the bowl. Stir the contents of the bowl, set aside, and let the liquid cool to room temperature. Cover and refrigerate your made-from-scratch jellied cranberry sauce until it's time to serve.